Calling the Glock successful is like referring to Bill Gates as "well off." The Glock is carried by millions of civilians and law enforcement officers alike, and a number of military forces across the world utilize it as a primary service pistol or distribute it in limited numbers to specialized units. The original Glock 17 was the first commercially successful polymer-framed pistol and set the standard for handgun reliability. The point being, few firearms can hope to approach the ubiquity of Gaston Glock's namesake pistol. However, that hasn't stopped many from trying. One such new attempt is the Turkish-made, Century-imported, TP9SA in 9mm parabellum. Rather than speculate over which is superior, these two polymer-framed pistols will be compared and contrasted across three crucial elements of design and three economic factors. This experiment will pit them against each another to determine whether the Glock 17 still reigns supreme, or if the Canik TP9SA can dethrone it. Before accuracy, ergonomics and all other aspects of a firearm's design, the most crucial component of performance is its dependability. If a firearm isn't dependable, then it is almost immediately doomed to failure from its inception. Back when revolvers were seen as the answer to the question of reliability, Gaston Glock shattered this convention with his original Glock 17. To this day, it remains one of the most reliable handguns ever built, and largely because of its reliability, it also remains one of the most popular. The Glock's rugged dependability is without question, as it has seen abundant use and abuse with civilians, law enforcement and military forces. With Glock setting the standard for reliability so high, any competing design must be functionally flawless. Thankfully the Canik TP9SA is based on an already-proven design: the Walther P99. It deviates from it by incorporating a push-button magazine release, alternate grip profile and de-cocking button on the slide. The latter of these is a superfluous remnant of its double, single-action progenitor, the TP9. While both designs have proven lineage, the TP9SA hasn't been around long enough to compete with the near-mythic status of the Glock 17's reliability. A cursory search of popular video-hosting sites and gun blogs reveals countless torture tests having little to no effect on the Glock. In my limited experience of having fired over 1,500 rounds through two separate TP9SA pistols, neither experienced any malfunctions even when devoid of lubrication. Ultimately, both are reliable enough that shooters should feel comfortable carrying either of these handguns. However, given its lengthy service life, the Glock 17 comes out slightly ahead in this category. The next category to consider is accuracy. A pistol isn't worth its weight in brass if it patterns like a cylinder bore shotgun. 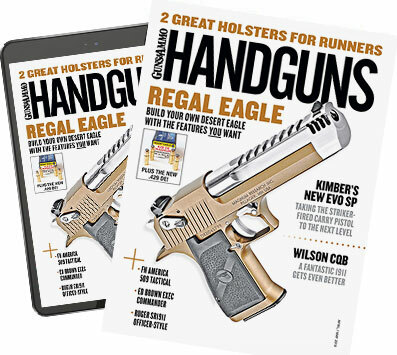 Neither handgun is compact by any metric, so they were both shot from a rest at 25 yards with four brands of ammunition to evaluate their capabilities as competition or serious home-defense options. Both handguns were tested with a combination of plinking and defensive ammunition. Covering a wide spectrum of performance and price, both pistols shot Hotshot Elite 115gr FMJ and Winchester NATO-Spec 124gr FMJ ammunition. Later, both handguns were chronographed and accuracy-tested with a pair of defensive loads from SIG Elite Performance Ammunition and Federal Premium. With similar-length barrels and locking mechanisms, the two pistols produced very similar velocities from the same cartridges. Accuracy wasn't tremendously different from the two pistols, though the TP9SA had a slight performance edge with Winchester NATO-spec 124gr +P, making it more appropriate for competition use. The next point of comparison is the most subjective of the list, ergonomics. Since this aspect ties into felt recoil and is directly related to both shooter experience and hand-size, three different shooters tested the gun. One is over six feet tall, weighing around 275 pounds, another is five feet, four inches tall and 90 pounds. The last, myself, is five foot, nine inches and 155 lbs. Essentially there was one large, one medium and one small shooter â€” both in terms of stature and more importantly, hand size. Objectively, the Glock has a larger, wider grip. This makes it inappropriate for smaller-handed shooters. Despite this, all testers found the gun easy to shoot with minimal recoil and no discomfort while engaging in rapid-fire exercises. That said, both the medium and small-handed shooters found the controls inaccessible without shifting their firing grip. This is remedied by installing an extended magazine and slide release, but from the factory, the pistol isn't a perfect fit for any but the largest of shooters. The TP9SA, on the other hand was found to have perfectly accessible controls to all shooters. However, the TP9SA's aggressively checkered backstrap dug into the small tester's hands during extended shooting sessions. This effectively made these two handguns equal in terms of shootability and ergonomics, with a fraction of an advantage given to the TP9SA. The last thing shooters should consider when deciding between two products is aftermarket support. If a shooter tracks down the greatest concealed weapon ever made but can't find magazines or holsters, then it's just a really small range plinker. The bane of new designs is aftermarket parts since most companies that produce them only want to do so for established, popular products. The problem being that some products can't become popular without that support. Glock sets the gold standard for handgun aftermarket parts selection. Countless manufacturers churn out an endless array of Glock-specific products. Right now, no fewer than four companies are currently producing magazines for Glock pistols. For Turkish newcomer Canik to dethrone the Austrian monarch, its TP9SA will have to play catch-up at a breakneck pace. Thankfully, Canik realized this early, and it ships its TP9SA with a Serpa-style retention holster. It may not offer the same modular flexibility as the near infinite Glock market, but it solves the largest issue with new pistols designs: finding a holster. While this is a good step in the right direction, the TP9SA will have to stick around for at least a decade to reach Glock-levels of market saturation. Massive advantage goes to the Glock. While both handguns are excellent examples of modern polymer-framed pistol design, one must be better than the other. Unfortunately, with similar size, weight and identical magazine capacities, the only deciding factors are either situational or subjective. Either which one feels best to the perfective shooter, or how much gun-specific gear they intend to purchase. Shooters who like their dedicated bedside gun to have five magazines, custom sights or to act as a suppressor host will find the Glock 17 a better fit. Those not invested in a pistol platform that want an affordable, reliable handgun in a common, inexpensive caliber that ships with enough gear for the average shooter will find the TP9SA an attraction option. Personally, given my embarrassingly large stockpile of Glock magazines, aftermarket parts and extensive experience with the pistol, I will go with the Glock 17 for the foreseeable future.